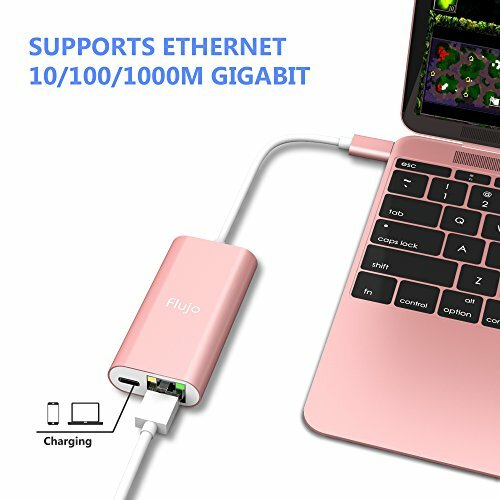 Description: The CH-14 allows you to add networking capabilities to a computer without through a Wi-Fi connection. Additionally the USB-C port on the adapter can charge your devices at with a maximum power of 60W an appropriate USB-C charger to the USB-C port, while being connected to your display and peripherals at the same time. 3,18-month warranty and friendly customer service. If you're anything less than amazed by any usb-c adapter, you can return the dock no-questions-asked for A 100% Refund. We have 18-MONTH product warranty & 30-DAY money back guarantee. Interface Type C/F do not supports data transfer, only charging. 【2-IN-1】USB C to 1 RJ45 adapter +1 USB C Female Charging port, Power Delivery Function. 【ULTRA PORTABLE】lightweight and fits into your pocket and in your camera bag when traveling. 【STURDY AND COMPACT】Mac Style design and lightweight aluminum housing for superior portability. 【PLUG AND PLAY】OTG device, Used with no external drivers or power required. 【CUSTOMER SUPPORT】18-month worry-free warranty and friendly customer service. If you have any questions about this product by Flujo, contact us by completing and submitting the form below. If you are looking for a specif part number, please include it with your message.